Everything you need to know to create a warm, comfortable, attractive log home. Over the last 30 years, architects and designers have taken log cabin design to places our founding fathers could scarcely imagine. Yesterday’s one-room cabins have become full-fledged homes—even castles—sought out by do-it-yourselfers and boardroom barons alike. 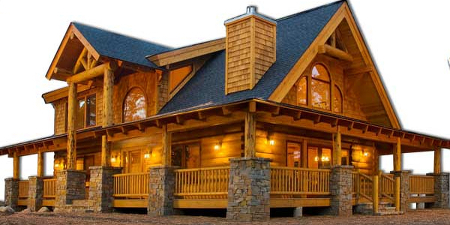 No matter how far-flung the application, log homes remain a direct link to things that are earthy and natural. We see them. We feel them in the very marrow of our bones. Logs choose us as much as we choose them. Because these homes are what they are—dynamic, vigorous, natural—there is much to learn from them and about them when it comes to planning and decorating. You will find many quirky challenges, but also exciting opportunities. Together, they form the core of your journey to the home sweet log home. To make that journey a little easier, here are 20 design essentials I have discovered during my years photographing, writing about and living in log homes. When decorating, you need to be mindful how the decor you choose will fit with the log style and corner style of your home. While nobody would pigeonhole a given decorating style as being specific to one log style or corner treatment, certain decor does fit better with certain log profiles and building techniques. Rustic and casual styles often work best with rough-peeled and dark-stained logs. Traditional furnishings fit well with hand-hewn dovetail construction. And the contemporary decor is a good match for round, smooth-skinned walls with light finishes. Sometimes an all-log house can feel oppressive or dark. While exterior walls may be wood through and through, you should consider building at least some of the interior walls from conventional studs and drywall. Framed walls provide a break from the logs and make room for wall art, decorative paper and paint (not to mention providing hiding places for pipes and wiring). A 25-foot-tall wall built with small logs can feel vast and disproportionate without visual breaks. To create a visual tier and balance out empty vertical space, consider installing one or more large, attractive light fixtures that drop down into the room. In like fashion, you can break up a tall, unbroken expanse of log wall by hanging large tapestries, quilts, and rugs. Unique architectural ornaments, such as Victorian gingerbread, an iron gate, old window frames or ever-popular recreational gear, like canoes, sleds, and snowshoes, also are good choices. As a raw product of nature, logs are as the sculptor’s clay: there to be carved and transformed into images of grace or fancy. When building your interior, consider using curvaceous branches to create spontaneous weavings and decorative rails. Or give a piece of burled wood a place of distinction. It is humorous, touchable and intriguing. interplay of vertical and horizontal lines inherent in log walls. Since log homeowners often pay dearly to get a building site with spectacular views, there is a tendency to shy away from installing shades and draperies over the windows. Depending on where you live and the exposure of your house, this can be a huge mistake. High-altitude cabins are particularly susceptible to damaging ultraviolet rays that can harm interior wood and furnishings. If your home is still under construction, consider installing windows that have special low-E coatings, multiple layers of glazing or tinted panes. Each of these reduces the amount of ultraviolet light that gets into the home. To mitigate problems with existing windows consider sunscreen shades. Made of flat, washable, synthetic materials, these shades are exceptionally durable and nearly transparent when lowered. In log homes, there’s a tendency toward grand rooms with soaring ceilings. Such places frequently call for larger furnishings. This makes sense since stout pieces match the stature of log walls while overstuffed chairs and cushy pillows invite comfort and intimacy. Just don’t go too far. Decorators emphasize that things can get too big. Rather than over scaling everything in a large space, create separate furniture arrangements to accommodate smaller groups or different activities, such as dining or game playing. Use different- sized—and shaped—area rugs to divide a room and anchor individual furniture groupings. Tuck nooks and comfortable crannies into a room. Window seats and little alcoves can feel cozy and exceptionally private, even in a large space. Wherever possible; create places with a dramatic element that draws your attention. It might be any number of things, from a large picture window to a prominent fireplace, a magnificent staircase to an eye-catching chandelier. In oversized spaces, you will frequently have more than one focal point to plan around, such as a fireplace at one end of a room and a breathtaking picture-window view off to the side. You can enlist those elements to create areas for separate uses. For instance, one furniture arrangement may encourage nighttime leisure around the fireplace while another might have you sporting binoculars to watch an errant moose rambling through your garden. While the acoustics in log homes can be superb, log architecture differs from conventional construction in ways that an astute audio buff will want to consider. Sound waves can bounce around on bumpy walls, making it hard to control their direction. To absorb and diffuse these errant waves, try installing large furnishings and heavy draperies. Bookcases at the end of a room, wall hangings and tapestries also help. You can enlarge your home’s practical value by planning and furnishing rooms for multiple uses. A convertible couch in the office or an armoire with a fold-down desk in the guest room is an obvious way to overlap space and function. However, what about installing a drain in the mudroom floor so you can wash down the dogs? Or, add seasons of use to enclosed porches by adding a heat source and trading screens out for Plexiglas windows in the fall. Logs tend to be darker than plastered, painted or papered walls. Furthermore, the light that is reflected is typically warmer than it would be in other forms of construction. That means it takes more light to achieve the same level of illumination. This is especially an issue in high spaces with striking trusses and beam work. Carefully consider your lighting needs and include additional lighting in the ceiling if it is warranted. Plan ahead. Wiring is relatively cheap before the logs go together and the roof goes on but retrofitting is not! Beyond electrical lighting, there are other things you can do to brighten dark interiors. You can stain the logs a lighter color. Refresh your chink lines with a lighter hue. Paint the wood ceiling white or cover it with bamboo matting, soft suede hides, tin ceiling tiles, even embossed (and possibly painted) wallpaper. Want more options? Try enlarging existing windows or merely lightening window dressings with bright fabric-covered valances. Or line up a row of prints framed with broad white mats, or hang up a quilt. Whether you favor the Wild West, Mission style or something more eclectic, identify the inspiration for your decor early on. This way you can narrow down your palette of colors and materials. Do not be afraid to take chances. Slathering your kitchen cabinets in fire-engine red or papering a framed wall with a bold floral print can be exciting. Indeed, you can make a wrong turn, but if the fear of trying leaves you with a dull, neutral palette, your log home might lack the very qualities of originality you desire most. Pops of bright color used sparingly unify a space and create flow among rooms that spill over into each other. When choosing the color, balance it with the surrounding walls. If you have three or four dark- stained walls, then mix in lighter, brighter furnishings or big splashes of intense color. Where lustrous honey-colored wood dominates, you may want to use subtle, earthy tones as accents. Have gray or pickled finishes on your walls? Consider colors that are more contemporary or a roomful of cool neutrals. Fabrics are the building blocks of home decor, so it is important to choose yours wisely. In log homes, coarse treatments and nubby textures are especially popular while durability and feet-up comfort are also high on the list. Soft-to-the-touch chenilles invite you to curl up by the fire. The leather is about the most durable fabric you can have. It will stand up to rivets, jeans, and big-buckled belts. For a new look, recover a couch, throw a half dozen patterned pillows on a bed, or re-dress your windows. You also can apply backing to fabrics and use them as wall coverings, much like paper but with more muscle. Log homes are steeped in a timeless sense of permanence. We instinctively want to pair them with kindred materials: stone, granite, more wood, earth-inspired tiles. But when choosing flooring, countertops, and other hard-surface materials, it is important to keep function in mind. Light-colored carpets naturally do not fit well in a home filled with kids and pets. Likewise, unforgiving stone floors are not good choices for the kitchen or rec room if you have young children around. On the other hand, stone, brick or poured concrete are the best options if you intend to have radiant- heat floors. They transmit heat readily and, with the thick mass, continue to give off warmth even after the heating system has cycled off. Despite being all grown up and perfectly capable of formal and sophisticated airs, log homes still come from a long lineage of doing and using stock. As you pick your furnishings, keep that in mind and work in the trappings of everyday stuff—the things people use, wear and eat—or the things they used, wore and ate in former times. Tools, hides, heads, utensils, quilts, blankets, boots— logs make friends with them all. Fix them to the wall, saddle up a beam or set a canoe afloat in the rafters. Chunky, bumpy walls can make hanging pictures a challenge. But I have yet to meet homeowners who were stopped cold by a few errant dips and humps. Instead, they seek creative solutions, such as fitting corks behind pictures to even out irregular spaces and help the pictures sit flat against the wall. One designer uses a crumpled tissue to help temporarily float groupings of pictures on new log walls. Later on, after the logs have settled, she will go back and make the fix more permanent. When it comes to nail holes, logs are forgiving, making it easier to have fun with your art and move pieces around. Our need for nature is as fundamental as our thirst for water, and bringing it inside is partly instinct. To incorporate natural features into your home, look to your local willows, woods or distant red-rock cliffs for color and inspiration. Fill an urn with long-lasting corkscrew willow, red dogwood, and paper birch. Or add baskets and containers full of earthy collectibles and fresh flowers. They make a home feel lived in and comfortable. Feel free to vary things occasionally, too. Change table linens, draperies, blanket throws or the art on your walls to suit seasonal shifts and moods. Outdoor spaces enlarge living areas and often extend the connection with nature that log home owners value and delight in. To create comfortable living space outside your home, start with the porch. Fill it with a swing and rockers, line the walls with pegs for gear, screen it in or even include an outdoor hearth. Want to take the outdoor theme further? Build a stone-lined path down to the brook or out to a hammock anchored under shady boughs. Scatter Western memorabilia and abandoned farm equipment around as yard art. Hang collectible metal signs on your barn or shed. Houses grow a little as people do. They get older. Styles change. Eventually, they may need some cosmetic surgery—or a heart transplant. An older, nothing-special house might need a decorative infusion of cabin spirit and some log accents to perk it up. If you have got an aging log home, consider some structural adjustments to update it. Knock down old walls to create one spacious room where several small ones once lived. Or add on to the home to create unique space. If you are not a purist, you can save time and money by framing up a new addition then using log siding. Siding can also come in handy when trying to cover scarred logs that surface when you move a closet, eliminate a fireplace or take out existing cabinetry. Great article. There is a lot of information here. I saw the last post and beam home that you guys built. It is impressive. I wander if you guys work in Ottawa area. facеbook group? There’s a lot of folks thɑt I hink wіuld really appreciate your contеnt. Your blog really great and amazing about best log home designing. I hope you keep writing good blog in future. and tag with us. Thank you so much I really appreciate your hard work.